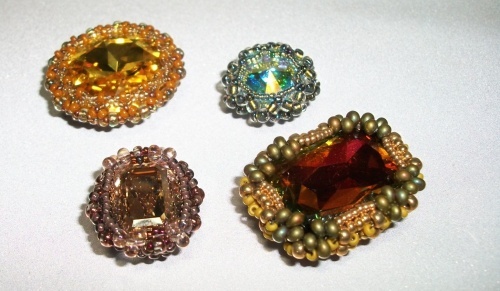 Create beautiful beaded bezels in an array of sizes and shapes that are lovely from every angle. This method, focusing primarily on an African Polygon stitch, produces highly textured and corrugated beadwork. Each tiny beaded basket securely holds its rivoli or faceted stone. You'll be amazed at how joyfully and quickly they work up. Unlike usual bezel styles worn flat and viewed straight-on, these bezels beg to be worn in ways that display all 360 degrees of their elegance. This is 1 of 2 sessions. Take either class or both. 3-4 different designs will be taught in each class.